To get the full benefit of the StumbleUpon community, you need to have an army of supporters. It’s very similar to growing your network in real life. No one wants to talk to themselves, so they go and find people that are like-minded. The same is true for StumbleUpon. Your number-one goal in the beginning is to actively grow your network. How does one grow his/her network? Well, we’re glad you asked. Quite simply, you have to actively share content directly with other Stumblers. This is the number-one way to get on other users’ radars. 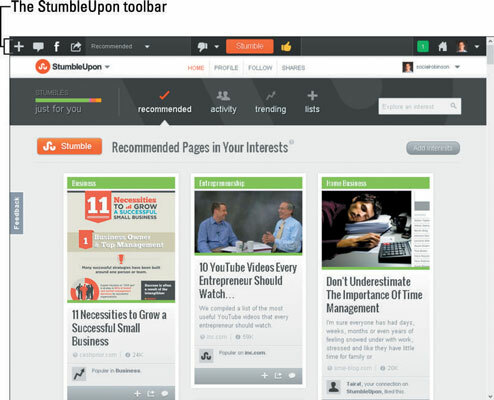 The StumbleUpon Toolbar is there for a reason — use it! The StumbleUpon toolbar is the most efficient way to use the social network, because it gives you instant access to StumbleUpon features on any page that you are on. So how do you make the best use of the toolbar? To be quite honest, you have many uses for the toolbar, so we’ve put them into a list. Then you can try each task to see what works best for you. Stumble new pages by clicking the dark orange “Stumble” button. Like a page by clicking the Thumbs Up icon. This means that you would like to see similar pages in the future. It will also store the page in the Likes section of your profile. Add a page to one of your lists by selecting the plus sign. Truly one of the best features of StumbleUpon, the ability to quickly add a page, helps you organize and save the pages you find particularly interesting all in one place. You can also add the same page to multiple lists. Dislike a page using the Thumbs Down icon. To spell out why you don’t like the page, click the drop-down arrow and choose a reason from the menu that appears. Doing so helps improve your user-specific Stumble algorithm. Share the page to Facebook by clicking the f-icon. This option also lights up when you like a page. Share the page on Twitter, on LinkedIn, through e-mail, or through StumbleUpon. To share a page with another Stumbler, he or she must be following you. See who has commented on or liked the page by clicking the Speech bubble. Click the View All Comments link to open a new tab with all the user feedback the page has received, including Likes, Comments, and the lists it has been added to. Click the drop-down menu at the upper-right corner to Stumble specific Interests, edit your current ones, or Stumble a different stream. This is also great when you want to check on the recent activity of the people you follow or on posts that are trending on StumbleUpon. Check your shares, messages, or Stumble updates. If you have anything new, it will show up as an orange number inside the green box near the right side. The number will stay orange until you open the page. If you don’t have any new Shares or Messages, the number will be a white zero. Return to the Home page by clicking the House icon. Do share content that others will find valuable or entertaining. Don’t share content that doesn’t add value. Do share content with your StumbleUpon friends as well friends and followers on other social networks. Don’t share content that could offend people. Do share content with e-mail contacts if they are not on StumbleUpon. Don’t only share content that’s designed to promote your site. Mix it up with third-party sources. Share content that you find on the web. Keep track of each share in an Excel spreadsheet. Each month, go back and check to see what the Like and Share count is for each particular piece of content. Also see if there are any comments directly related to your contribution. Rinse and repeat every month. Connect with the Stumbler on other social networks like Twitter and Facebook. Ask each Stumbler if the content is up their alley, and if they would like you to continue to share that type of content with them. (All through private messaging.). Ask them to do the same if they’re willing. Do leave comments on interesting pieces of content. Do interact with other commenters on a piece of content. Don’t be rude or put anyone down for his/her comments. Don’t be self-promotional with a link to your content. Keep the conversation focused on the subject — at the piece of content.